11. Alfred Edward Mathews (1831-1874). 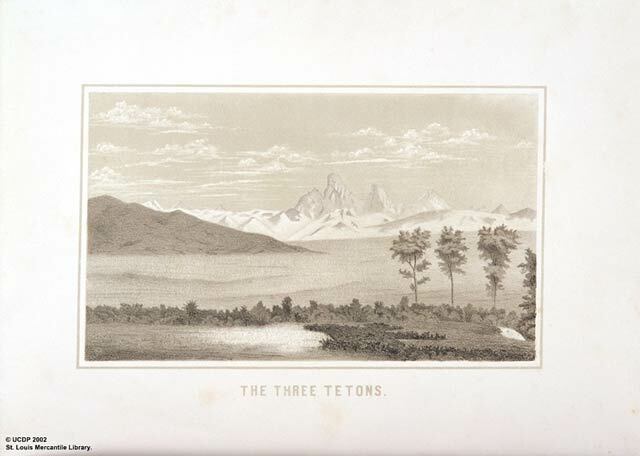 The Three Tetons. Tinted lithograph, Plate 14. Mathews, A.E. Gems of Rocky Mountain Scenery. New York: The Author, 1869. St. Louis Mercantile Library at the University of Missouri - St. Louis. "These singular mountains are justly ranked among the high peaks of the complicated ranges that form the Rocky Mountain Belt, and are located in the Territory of Idaho. They are exceedingly rugged, and abound in frightful precipices with corresponding chasms. The view is from the Salt Lake and Montana state road near Kamas Creek, in Idaho Territory looking east and represented these peaks at a distance of about 125 miles."